Some of us have just done it and others are about to do it but this week sees many of us changing our clocks to go onto winter time but why do we do this often quite annoying ritual. In the old days every town and village in effect had its own time-zone. When the sun was at its highest point in the sky, everyone knew it was midday. If people travelled across the country on foot or by horse then they would simply reset their watch at their destination. This all served us well for thousands of years until someone went and invented the railway and then there were immediate problems. What was 10am in London was not 10am in Liverpool. For a while people did try and create complicated train time-tables taking into account the day/date and co-ordinates of the train station but in reality it was all too complicated. 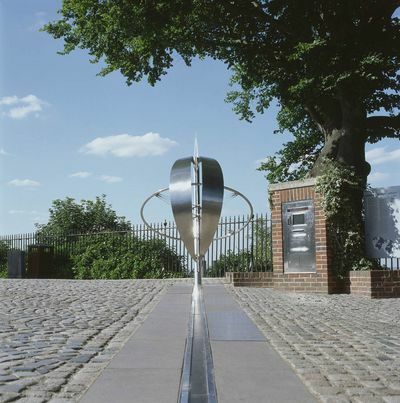 Countries all round the world were quickly forced to standardise their time and the Washington Conference designated that the global reference point for time would be the Prime Meridian Line in Greenwich, London. The world In each time-zone the sun be at its highest point at midday. 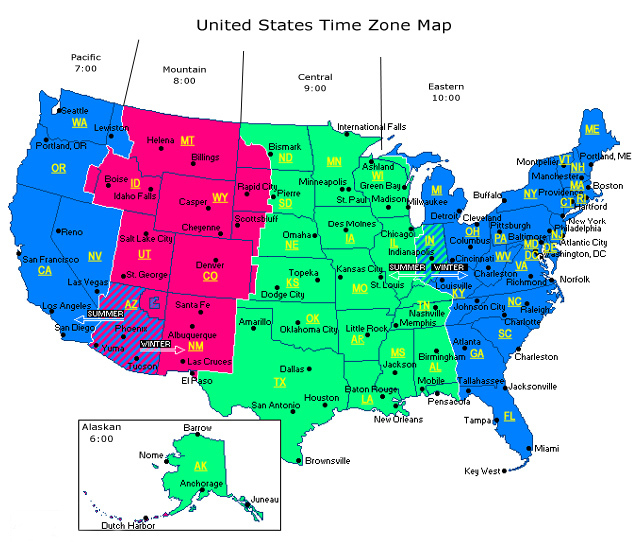 Some countries have many time zones, others are just 30 minutes difference from their neighbours while others still change their time-zones and even days to for economic reasons if they trade with a richer state in a different time-zone.Countries or parts of countries can change their time-zones quite radically. 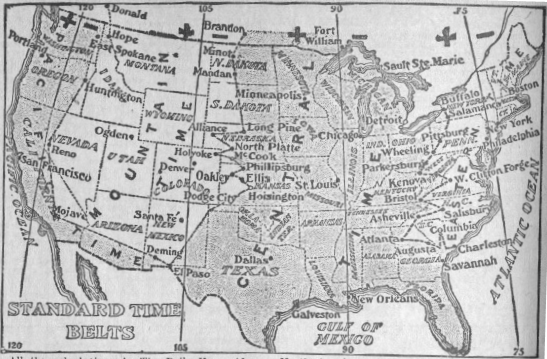 Look at these two time-zone maps showing how time has changed in the United States in the last century. In Europe WW2, changed time for many nations as they were forced to operate at German time. After the war, nations like France, Netherlands and Spain didn’t bother to revert back. However, nothing is forever and there are currently voting going on in Spain to return to their GMT time rather than their CET time which will bring their time more in line with the time of day outside.As early as 1784 the American ambassador in Paris stated that the French could save money on their candlewax by getting up earlier and going to bed later, hence the proverb “Early to bed, and early to rise, makes a man healthy, wealthy and wise”. George Vernon Hudson proposed that they should consider day light saving in 1895 but Daylight saving time really got started in the second decade of the 20thC century when English builder William Willett got angry that his fellow Londoners slept through the early morning sunshine and was equally unhappy that his rounds of golf after work had to be hurried due to the impending dusk.During WW1 it was adopted one way or the other by most of Europe and North America though after the war only Britain, France, Ireland and Canada kept it going. The oil crisis of the 1970’s saw many countries adopt it again.Many countries however no longer follow it and countries near the equator hardly ever do as their day lengths are the same 12 months of the year. It’s important to remember that we all get the same amount of daylight in the world but the nearer you are to the poles, the more all of it comes at summer and less of it comes at winter.The idea of Daylight Saving is that is saves us money and the country, whichever one we live in, resources. It is also said in many places to make it safer for children going to school in the mornings. It makes it get lighter in the mornings by an hour but also darker earlier in the afternoon by an hour.In reality though many people really don’t like the changing of times. These days, more and more of us have low-energy light-bulbs and in many areas most children no longer walk to school. In fact most of us would benefit from it staying lighter in the winter afternoons when more people are out and about. Besides which, by mid-winter in London, it is still dark by about 4pm and at that time people are still coming home from school and getting ready to leave work, without daylight saving it would stay light until 5pm. Further north of course it is dark already.This illustrates some of the problems of having time-zones purely on a north-south axis. The difference in day lengths between Miami and Boston is quite dramatic. 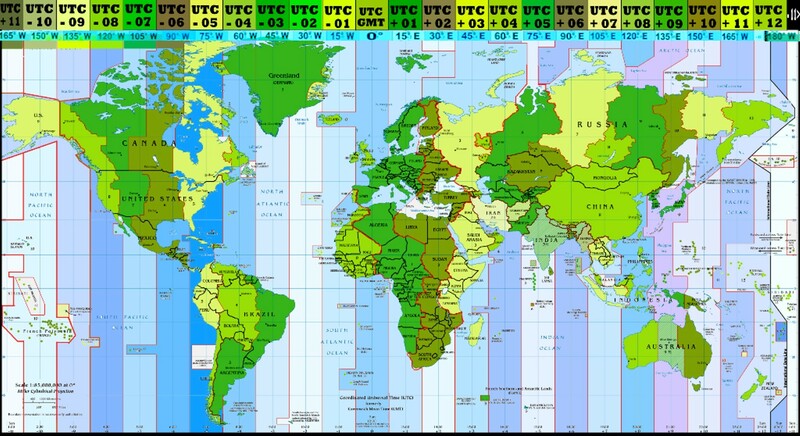 For countries further north the differences in that one or two hours daylight saving are even more pronounced. On the same latitude, our sunsets are just 30-45 minutes apart but the difference with north and south can be much more extreme. In Britain we have just one time-zone, we’re not that wide but we are quite long. I’m talking country size here, not people! The difference in sunset times between north and south is over an hour. There has been much talk about creating a horizontal time zone either between England or Scotland or at a parallel line somewhere in northern England.No body does much in the early mornings, except for those of us who have to go to work and from personal experience that means getting up in the dark 8 months of the year so if early risers can do it, so can anyone. Of course, in some areas of Britain it would mean it doesn’t get light until 10am but then it already doesn’t get light in some areas until 9am. The difference in having more winter afternoon light in places where it could make some good would be incredible. If we were to ditch daylight saving, then more of us could get home in the light or feel more positive about walking, jogging or cycling in the afternoon. This would be even more the case in some areas if they used double daylight saving and keep their clocks permanently 2 hours in front. Really, when setting times, more consideration should be given to latitudes as well as longitude. Wherever you live, changing clocks is time consuming and for many people their body clocks are messed up for several weeks. I know I have been waking up at 4am this week after our clocks changed and missing my favourite tv shows in the evening; they may run on winter time but my bedtime remains the same number of hours after I woke up. Areas in blue still operate Daylight Saving, those in orange no long operate Daylight Saving and those in red never have. Recent research has also shown that particularly in men, suicide rates increase greatly after clocks change. Isn’t life difficult enough without us making things harder for ourselves? Where do you live and do you find day-light saving a pain? Do you like having a bit of extra daylight in the morning or would you prefer it in the afternoon? If you’re like me it’s often irrelevant as many get up in the dark and come home in the dark. This entry was posted in history, Science and Engineering and tagged BST, clocks, Daylight Saving, GMT, Greenwich, history, Life, Maps, Time, Time Zones. Bookmark the permalink. 15 Responses to A brief history of time(zones) or why do we keep changing the clocks? Fascinating. Some of this I knew and some falls into the “I’ve always wondered about that” category. Thanks for the history lesson. Glad you like it Dale. Thanks for checking my blog as always. Thank goodness the idiot politicians have neither been able to move England onto Berlin Time, or brought back Double British Summer Time. In this day and age there’s no sensible argument for England, (at least), moving to BST. Greenwich Mean Time was good enough for Brunel so it’s god enough for me. I’d agree wholeheartedly. I have no problem with other parts of the U.K having their own time arrangements either. The thought of going to CET is bizarre especially now Spain is considering going in reverse. The politicians don’t care as they rarely get up at 5 or 6am in the dark or drive home in a gloomy rush hour. You are very welcome, Stephen!!! I guess it all depends one where each individual lives as to whether the time in winter or summer is best. Pardon me for speaking simply, but I think it is stupid. No daylight is saved by moving a clock’s hands. To get the most daylight, one must get up when the sun does. We could adjust our schedules seasonally rather than being a slave to 9-5 or whatever. I naturally send to sleep later these days and get up earlier when spring is on the way. We learn in school that noon is midday, 12 o’clock, but now we have created a world where that is not true. I agree. Daylight saving is a bit of a con as we don’t save any daylight whatsoever. I think that is an excellent idea, our lives should revolve around the circumstances where we live and not on the whims of people hundreds or thousands of miles away. It does seem natural for those of us who have dark winters to to do less in the day times and go to bed earlier than in the summer. Wow, how odd that some places in Britain don’t get light until 10 AM? That would be so strange. Fascinating stuff and a strange ritual we have in changing the time. Like we have such control over it! Yes it is strange, kind of like living in a submarine for 4 months. We do get the benefit, if there possibly can be a benefit for being in the dark so much in that during the summer it can be light from about 4am in the south and in the north it is only dark for a few hours and in some places hardly at all. Though I like long summer nights, I think I would be happy for it to get light and dark at roughly the same time all year round. I noticed that the birds coming to the feeder are coming at the original meal times. Our changing clocks back is fooling no-one but ourselves!